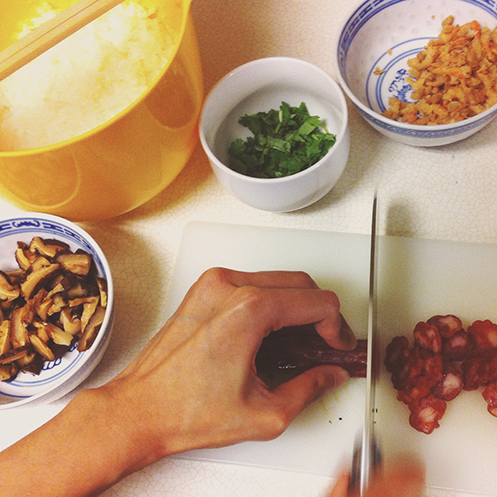 1) Chop mushrooms into thin strips. Roughly chop shrimps. 4) Heat wok (I used a frying pan because I don’t have a wok), quick fry mushrooms, shrimps and sausage with 1 tbsp of oil. Put in a dish and set aside. 5) Peel and shred daikon. Drain and save the liquid in a bowl, add water (I use the water from the mushroom soak, filtered with a coffee filter) to make 1 cup. In a bowl mix this liquid with rice flour. Set aside. 6) Heat wok (I used a large frying pan), quick fry the shredded daikon with the daikon seasoning and 1/2 tbsp of oil. Turn down heat and cover, cook for a few minutes until soft. 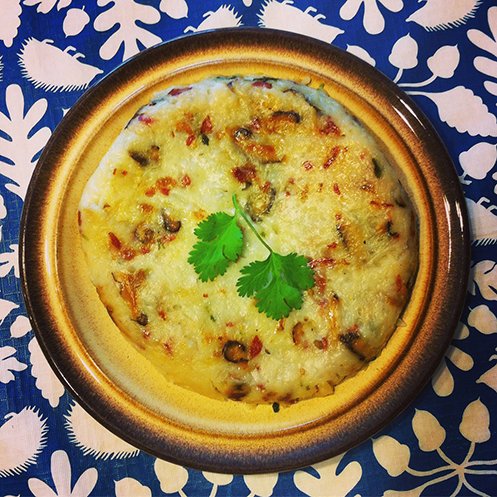 Mix in the mushrooms/shrimps/sausage and cilantro. Turn off heat. 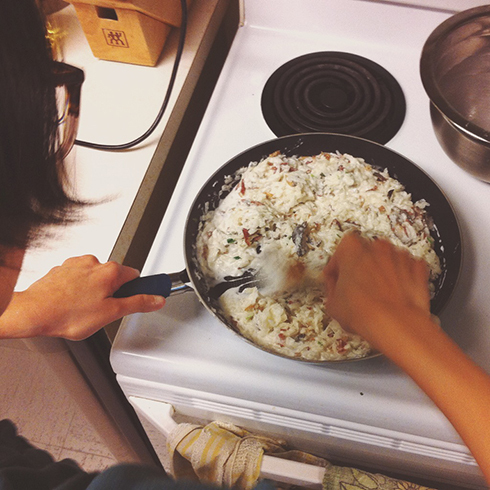 Mix in the rice flower mixture quickly. 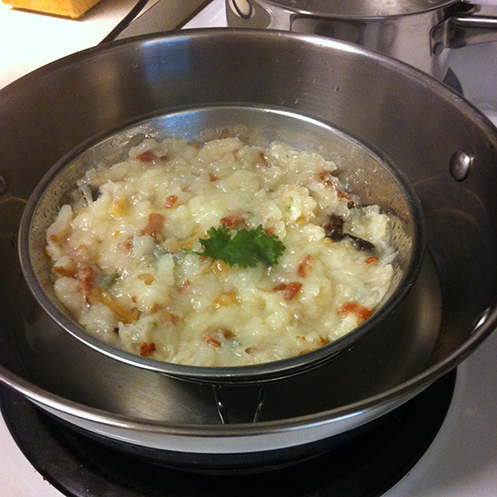 7) Grease rice cooker, pour mixture into rice cooker. Cook in rice cooker on white rice setting. It looked like I had enough to make 2 cakes so I made an extra small one on the steaming rack in the rice cooker, on a greased tin plate. 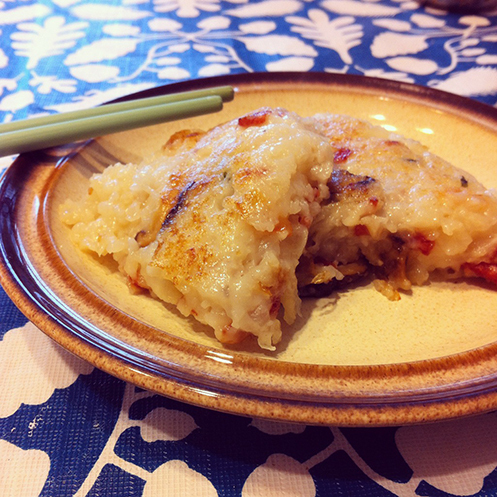 When the rice cooker finished cooking for the first time, the small turnip cake didn’t look cooked, and I wasn’t sure about the larger one in the rice cooker, so I cooked it again on the “quick steam” setting. After that the large one looked done (has a slight translucent quality), but the top one still looked uncooked (opaque like rice pudding), so I steamed it the old school way, until it looked cooked. May the new year bring you good health, much success and lots of happiness! Oh! comme c’est appétissant!! Pouvez vous m’en garder un petit morceau.…j’arrive!! haha thanks Claudine! 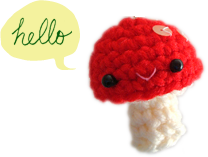 :D something I will definitely try making again — I think it can be improved!